Specifications: blades 22" or 24" on 9" spacing, 1 1/8" square plow steel gang rods, 3" x 3" steel tube frame, trunion mounted triple sealed bearings, cast iron spools, 5000 lb. 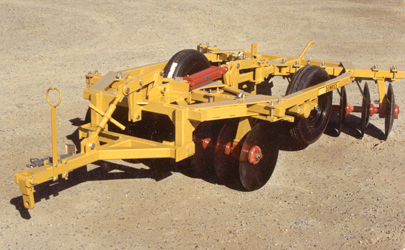 rated wheel hubs with double seals, slip-in wheel spindles with wear sleeves, 7.60 x 15 6-ply tires on 15 x 6 6-bolt wheels, 3" x 12" hydraulic lift cylinder, hose guide and center ripper shank. From 6'6" to 9'8"
Options: Blade cleaners, blade extensions, hydraulic hoses, utility hitch, drag brakets, blade options, tool bar brackets, dirt deflectors, flotation tires, clevis tongue, drop pin width, adjustment for front and rear gangs. Features: a vineyard wheel-controlled tandem disk with rugged tubular constructed frame, designed and engineered to withstand the normal rigors of the average vineyard.